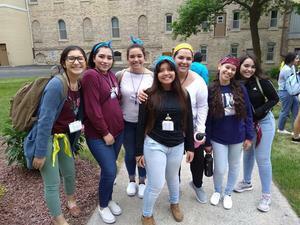 Six San Miguel seniors, one alumni along with three other Tucson young women traveled to Manitowoc, WI to participate in Camp Franciscan! 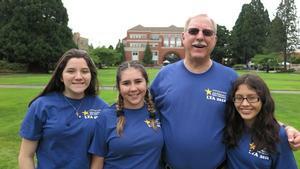 During June, 3 upcoming Juniors & Mr. Meyer attended Lasallian Youth Assembly in Portland, Oregon. During LYA they learned about Human Trafficking along with other Lasallian schools in our SFNO District. The Freshman Bridge Program has officially begun for the Class of 2022! San Miguel is very happy to welcome a new set of vipers to campus for CWSP training and summer classes. Thank you to former San Miguel faculty member, Mrs. Debbie Gordon and crew for bringing their furry friends to campus today! What a great way for students to relieve stress before finals. This past weekend, the "Faith in the Presence of God" mural was installed. Now all five Lasallian Core Principles are represented around San Miguel High School's campus. ​Thank you to the Class of 2017, along with Ms. Melissa Schwindenhammer and Ernie Sanchez. "To touch the hearts of your students is the greatest miracle you can perform” – St. John Baptist de La Salle. At San Miguel High School, we love our TEACHERS! They touch the hearts of our students in many ways. We are so thankful for them! At San Miguel's last mass of the year, the community celebrated our founder, St. John Baptist de La Salle. A huge thank you to Bishop Weisenburger for leading San Miguel in mass. 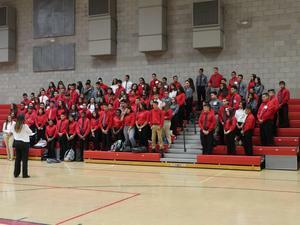 The future is bright for San Miguel’s Class of 2018! It's Religious Brothers Day! San Miguel would like to thank Brother Jesús, Brother Jack, and Brother Martin for all of their dedication and commitment to educating San Miguel students! Congratulations to our two students from San Miguel High School, Jasmine and Sarahy, who participated in the Young Entrepreneurs Academy over the course of ten months!